Telling people what a product contains can be a bit of a double-edged sword. On the one hand, it introduces transparency and empowers people to learn more about the products they use or plan to use. On the other, most people have absolutely no clue what those ingredients do or why they're used. This often leads to gross misunderstanding and misplaced fear. We see this frequently with packaged foods. Any ingredient that is hard to pronounce or sounds all chemically is viewed askance. This is compounded when it comes to medicinal drugs, which use the isolated, purified substance that performs a very specific function; the unpurified origins frequently contain hundreds or thousands of other chemicals that may lead to unwanted effects (e.g., compare asiprin to raw willow bark or digoxin to whole foxglove). Vaccines are a very prominent example of this fear of chemicals (and just to get this out of the way, everything in the world is some chemical or combination of chemicals). Earlier this year, I wrote about one vaccine ingredient, formaldehyde, in an effort to clear up why and how it is used in vaccines, as well as showing that the amounts found in vaccines are safe. Just the Vax and Science-Based Medicine also have good write-ups on the preservative. Recently, someone asked me about another ingredient: monosodium glutamate (MSG). Monosodium Glutamate (MSG), sometimes also called sodium glutamate, is the sodium salt of glutamic acid, a non-essential amino acid. It was first discovered in 1908 in Japan by Kikunae Ikeda. Ikeda isolated the specific compound responsible for the flavor found in dashi, a fish-based broth, that was uniquely different from other recognized flavors (salty, sweet, sour, bitter). As he experimented with the umami taste, Ikeda discovered that ionic glutamate was the substance responsible, and he tried various monovalent salts of glutamate to devise a way to use it as a seasoning in foods. These included barium, calcium, potassium, "ammonium, magnesium, zinc, cadmium, aluminum, copper, and iron" (Ikeda, 1909). However, these glutamate salts all had a metallic taste. The sodium salt of glutamate ended up being the most palatable and convenient to produce and use. Concerns about MSG started to rise in the late 1960s and 1970s after a letter by Robert Ho Man Kwok published in the New England Journal of Medicine in 1968 described a symptoms he experienced after eating Chinese food. The publication of his letter was followed by letters from many other individuals, describing a wide range of non-specific symptoms. At the time, a number of culprits were suspected: cooking wine, salt and MSG. Only MSG was investigated. As the years passed, the range of symptoms expanded with more and more reports from people. More information on the natural glutamate content of various foods can be found in the Food Standards Australia New Zealand 2003 Monosodium Glutamate Safety Assessment and on the Umami Information Center web site. Another possible source of glutamate is in some influenza vaccines. More on this later. As mentioned above, glutamate is a nonessential amino acid, meaning that it is not something we need to get from our diet; our bodies can make it on its own, in addition to getting it from our diets. Our bodies use glutamate for cellular metabolism. It also serves as a neurotransmitter. In this regard, excess glutamate has been implicated in seizures, though more research is needed. Glutamate from the diet is largely oxidized into CO2 as a fuel for the gut, as well as metabolized into other nonessential amino acids. It is also believed to be very important for the function of the infant gut. 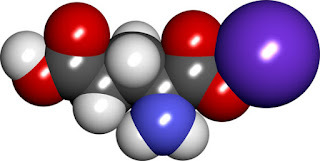 Glutamate is a precursor of the α-amino acids proline and arginine, and the peptide glutathione, the latter of which is frequently cited by biomed advocates as beneficial for autism, however, much of the research in this area involves small sample sizes, increased risk of bias in the results, and has been conducted by dubious researchers, such as Mark and David Geier and Russell Blaylock. With the potential role glutamate plays in seizures and reports of Chinese Restaurant Syndrome, just how much glutamate intake is too much? Mouse studies have shown significant neuronal damage in infant mice at a blood levels of about 100-130 μmol/dl (~14.7mg glutamate for a 1-8g infant mouse, or 1.8g of glutamate per kilogram body weight). Mice, however, also happen to be a species that is highly sensitive to glutamate damage. In humans, blood levels of that amount have not been achieved, even at single doses of 150mg per kilogram body weight. Further, studies have shown that infants are just as good as adults at metabolizing glutamate. A daily intake of up to 6,000mg/kg is recognized as safe. With regard to so-called Chinese Restaurant Syndrome (also referred to as MSG symptom complex), several large, double-blind, placebo-controlled trials failed to find a causal connection between MSG and the reported symptoms. There is some suggestion, though, that large doses of MSG taken without food cause more reactions than placebo, but the frequency of reports is low and of a transient nature, but these findings were inconsistent and unable to be reproduced. All of this has to do with food and dietary sources of glutamate, whether through the naturally occurring free ionized glutamate or through MSG. So what does this have to do with vaccines? Why would it be added to any vaccine? In addition to its flavor-enhancing properties, MSG also happens to act as a stabilizer. They help to prevent chemicals from interacting or separating out, as well as preventing oxidation or damage from light. It is this ability to keep things from breaking down that MSG is added to vaccines, protecting them from being altered when "exposed to heat, light, acidity, or humidity". Now that we know why it is added to vaccines, which ones actually contain MSG, and how much? Not many actually use it. Glutamate is added as a nutrient to the growth medium for MMR-II and is not in the final product in significant amounts; monosodium glutamate is added to FluMist (0.188 mg/0.2 mL dose); monosodium L-glutamate is added to ProQuad (.4mg), Zostavax (.62mg) and Varivax (.5mg); and potassium glutamate is added to RabAvert (1mg). How do these discreet doses compare, then, to other sources and to what we know about safe daily intake and metabolism? In short, the amount of glutamate, in any form, found in vaccines is miniscule in comparison to other sources of the chemical, and it is a drop in the ocean compared to daily intake. The flavor-enhancer monosodium glutamate has a long history of stories of bad reactions after eating it in foods, particularly from American-Chinese restaurants. However, the reports of adverse reactions are anecdotal and not supported by rigorous, scientific evidence. Indeed, when examined in placebo-controlled, blinded studies, MSG disappears as a causative agent for these symptoms. In vaccines, MSG is used primarily as a stabilizer to prevent the vaccine from breaking down when exposed to light or to changes in temperature or acidity. In this role, each dose contains very little of the substance, being hundreds of times less than the exposure from a single serving of glutamate-containing foods and thousands of times less than the average, safe daily intake. The bottom line is that there is little reason to fear dietary intake of MSG, and even less reason to be concerned about MSG in vaccines. Thanks for providing this information. I think more information like this is needed! Have you done this for other ingredients besides formaldehyde? I'd be interested in reading them. I haven't covered any of the ingredients besides MSG and formaldehyde, yet. But I plan on doing more of these when I am feeling particularly motivated. They're a lot of work. This article seems to infer that MSG as the same as what naturally occurs in the body and in plants and other foods. It seems also to infer that MSG is same as Glutamic Acid. It seems to softly infer that allergies / sensitivities to MSG don't happen, or, don't have much impact. And, that other harsh chemicals are just fine to insert into the body--no worries. Has the author checked this with those studying Epigenomics? 1. HOW is the molecular structure of man-made Monosodium Glutamate different from naturally occurring version? === I believe the structure is different than naturally occurring. 2. HOW cleanly or perfectly does man-made MSG plug into receptor sites in the body, compared with the natural form? === I believe that the man-made molecular structures of MSG, and other man-made analogs of natural substances, are DIFFERENT, and therefore cannot cleanly, perfectly, plug into receptor sites; this leaves dangling bits that cause adverse effects. 3. What FORM Naturally occurs in natural, unadulterated foods, mother's milk, etc.? Is that actually Glutamic Acid, or Monosodium-Glutamate? === I believe it's Glutamic Acid which naturally occurs, which cleanly plugs into receptor sites, and therefore causes far less adverse reactions when used in concentrated amounts. BUT, since it was never meant to be used in concentrated amounts found in Food industry offerings, even the natural form can cause adverse reactions if given in concentrated doses. ALSO, most people are mineral deficient, particularly in trace minerals. When adequate trace minerals are given [such as from sea veggies/kelp], it markedly reduces or prevents the adverse effects of MSG, aspartame, etc. One can make convincing arguments about the safety of MSG or any man-made chemical or compound.. Many people will believe those arguments; usually those are people who never, or little, studied chemistry, have never dealt with whole industries and corporations protecting their profit margins, or how disinformation is salted into common lexicon, etc. IF MSG it is not identical to the molecular structure we need to consume, it fails to cleanly, perfectly plug into receptor sites.....but it DOES make a Patentable product. Any concentrated chemical we're exposed to in larger amounts--amounts that if we lived cleanly, we'd never be exposed to---can cause a problem in how or if the body can properly process it to protect the body from the harm chemicals can do. Certainly--EVERYthing is included in the broad umbrella of "chemistry". But our bodies were never designed to handle the amount of man-made, very stable chemical combos we're daily exposed to. The Cumulative and Additive effects are swamping us all, to one degree or another. Illnesses caused by, and added to, by exposure to too much and too many man-made chemicals and far higher concentrations, are helping rapidly implode our medical, disability and economic systems. People are being disabled by too much exposure to too many chemicals; the per-capita numbers are swelling fast, yet sliding under the radar. Even the CDC admitted giving too many vaccines at once, is bad, that it exposed people/ kids with immature immune systems, to too high levels of the chemicals in the vaccines given in large batches, not to mention expecting that immature immune systems can handle large batches of vaccines themselves. ...Yet CDC still promotes giving large batches, to gain compliance, even though they admitted there is connection between vaccines and the drastic rise in ASD, for instance. 1. The chemical structure of man-made MSG is the same as naturally occurring MSG: C5H8NNaO4. If the chemical structure were different, it would be a completely different substance and have a different name. If I take hydrogen and oxygen and apply heat, I synthesize water. That water is "man-made", yet it is no different from naturally occurring water. Both are H2O. 2. Whether synthesized by humans in a lab or naturally occurring in our food, MSG is metabolized the same way. Since the chemical structures are the same, there isn't a difference. 3. Both glutamic acid and its salt, MSG, occur naturally in our diets. When food proteins are broken down, some of the byproduct of that process is the production of the glutamic acid salt (MSG). (http://www.rsc.org/chemistryworld/News/2006/May/05050601.asp and http://www.hc-sc.gc.ca/fn-an/securit/addit/msg_qa-qr-eng.php). The key takeaway from my post is this: MSG is not the bogeyman a lot of people make it out to be. As with everything in your life, the dose makes the poison. Of course, if too much is consumed, it can cause adverse health effects, but it would take a <i>LOT</i> to do that. Our bodies create a certain amount of MSG, and we get some in our diets. When it comes to vaccines, not many actually use it, and the amounts found are miniscule fractions of the amounts that would cause adverse reactions. Give my article another read and follow all of the links I included. Hopefully it can help clear up any misconceptions you may have about the subject. Oh, and as a side note, your assertions about the CDC are incorrect. Please provide links to support your claims. There are two common forms of glutamic acid, L-glutamic acid and D-glutamic acid. L-glutamic acid found in protein is referred to as 'bound' or 'protein bound' glutamic acid. In real, natural foods amino acids are rarely free. Rather, they are linked or bound in long chains to other amino acids in peptides or proteins. D-glutamic acid 'outside of protein' or 'free glutamic acid' is artificially and chemically produced outside of the body. This is what is known as monosodium glutamate or MSG. 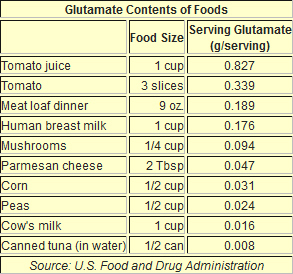 MSG added to foods is predominantly L-glutamate, not D-glutamate, since it is L-glutamate that gives the flavor. It's fermented foods, like soy sauce, that have higher amounts of D-glutamate. So, that's the first thing. Second, do not plagiarize. If you are going to quote another page, give proper attribution or your comment will be removed. Third, the source you stole from actually has some errors. For instance, they state that pyroglutamic acid does not occur naturally in plants or animals, but it does (http://www.currentscience.ac.in/Volumes/102/02/0288.pdf). It also suggests that MSG is "toxic", a common gambit used to demonize substances that are synthesized in a lab, despite their being chemically identical to the naturally occurring chemical. This ignores what I already mentioned above, that the dose makes the poison. Small amounts do not cause adverse reactions for most people. Those who are sensitive to MSG generally have short-lived mild to moderate symptoms that resolve on their own, and there is even some question as to whether this is truly a causative effect or not. Finally, it argues that additive MSG is chemically different than that which occurs naturally in foods. This is not true, either (see http://www.fda.gov/food/ingredientspackaginglabeling/foodadditivesingredients/ucm328728.htm). Todd W., I'm very interested in your responses to Chi's questions. Thank you Chi for bringing these forward. Feel free to show, with evidence, where the FDA site is wrong. Here's a (small) study that examined the very question of whether bound glutamate and added free glutamate (MSG) were metabolized differently, leading to different amounts of glutamate in plasma and erythrocytes: http://jn.nutrition.org/content/112/10/1953.full.pdf. The authors found no difference. Rather than using the rather quaint and dishonest tactic of poisoning the well with the shill gambit, why not address my points with, y'know, science? I'm open to changing my mind as the evidence warrants; I'm not wedded to an ideology. Oh, and I might add, since you bring up money as an incentive, that I find it interesting you do not apply the same standard to the site you stole your text from. They have a product to sell, and their sales depend on people believing what they say about the purported evils of MSG. I, on the other hand, am not paid nor do I have anything to sell. I try to get my information from the scientific evidence, not salespeople. what isn't explored here is the difference between the route of entry. Ingestion of chemicals is very different thaninjection. Ingesting MSG is quite different than injecting MSG. I believe there are mouse models showing this. Either way, using the digestive tract to introduce a chemical is quite different than injecting it intramuscularly. MSG, L-Glutamate, etc., in our tomato juice, breast milk, tuna, and other foods? Interesting, I guess that it is safe to inject those too? Are any of the writers and readers here planning on taking the Offit Challenge? Recall, in an interview in Mothering Magazine, Offit said that a newborn could take at least 10,000 vaccines in one day without harm or injury. Please let me know if you would like to do it. I can even raise money for you. You do realize that you cannot compare ingestion of a substance to injection? There are ways of easily protecting from heat and light and no reason that this should be added to vaccines considering the risks for questionable benefits. Vaccines are not safe and scientific evidence is coming out. Just search aluminum aduvant toxicity in pubmed to see what I mean. "Vaccines are not safe and scientific evidence is coming out." Oh, do tell us all about it! Provide us the PubMed indexed studies by reputable qualified researchers that any vaccine on the present American pediatric schedule causes more harm than the diseases. You made the claim, now you need to back it up with some real citations. "Just search aluminum aduvant toxicity in pubmed to see what I mean." Really? All we have seen are people comparing vaccine with intravenous feeding fluids for premature infants, which makes your "cannot compare ingestion of a substance to injection" claim kind of odd. And we also see "research" that was bought and paid for by the Dwoskin Family Foundation (which you can find by putting "Dwoskin" in the little search box at the top of this page).